Bethany McFarland was unnerved by how quiet it was around the house when her husband’s job required him to be away from home for days at a time. “I was not in need of a watch dog, but rather a companion,” she says. Woof is always ready for a hike. She had her heart set on a Husky because she knew them to be gentle and intelligent but fun. She entered her search criteria on Petfinder and within two weeks had found a match. 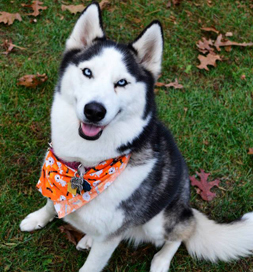 The Husky she spotted on the site had run away from home so many times that her family gave up on her and relinquished her. She ended up at New Beginnings Animal Rescue in Olive Branch, MS.
After a rigorous application process, the rescue group approved the adoption. Only one stumbling block remained. The dog was in Mississippi and the McFarlands live in New Hampshire. Fortunately, in 2012 the rescue had implemented a program to transport adoptable dogs to homes in New England. A Husky likes to work, and Woof considers it her job to chase away wild turkeys that fly into her backyard to graze. She barrels across the yard to rout the visitors. Before she can reach them, they lift off, flap over the eight-foot fence and land on the other side, out of reach. Woof herself has landed, too, only her landing is into the perfect family, one that knows what it takes to keep an energetic Husky at home and happy.